Last week we finally got internet access in our apartment, thanks to a satelite connection at the studio across the street and my wireless router I hooked up to it. My new laptop I got a few weeks ago can pick up the signal from across the street and through a couple walls. It's great to not have to go to the library in the next town (3 miles) to get email and do anything else. Last monday we went out to Laura's parents house and we all worked on getting the garden ready for spring planting. We got the garlic weeded, and cleaned up and chipped a bunch of brush. Lizzie and the other kids had fun hauling the junk to the chipper, where I would feed it through for mulch. We are also working on buying a house in Stephenson, but we realized we don't have any photos of the outside, so we will have to do another post about that. It needs a lot of work, but it is cheap, and it is big enough for us. For anyone who missed our email blast, our old sbcglobal.net email was killed when we disconnected our DSL when we moved. 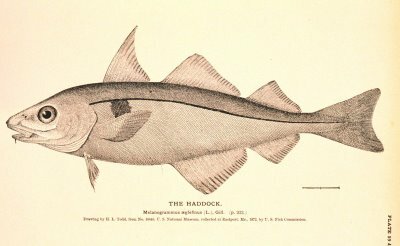 Our new email is michiganhaddocks@gmail.com. I think the family resemblance is all in the cheeks. Here are the kansas babies. As you can tell, I'm not very good at this text and picture stuff. I don't know how to do all that. Darren and Tracie didn't have any connections to put there pics on here, and Cassie wanted me to throw her a bone, so here you go! Tanner sure is a cutie! Abby is getting big, and enjoying using her voice especially loudly. Matt and I went to a Medial Transcriptionist seminar last night, and we signed me up for it, so I can be one in as soon as three months. It will be nice to be able to do some of that in my spare time, and while I'm at home with Abby. We will see how that goes. I love you all. So Larry sang in the Priesthood session of General Conference on Saturday, and thanks to Dad not being able to go, I got to use the extra ticket Larry had. It was great. I took a couple pics to show you all where I was. This first one shows the 1st presidency and the 12 leaving at the end. I was all the way at the bottom on the left and Larry was stage left behind the organ so I could only see him if one of us was standing. 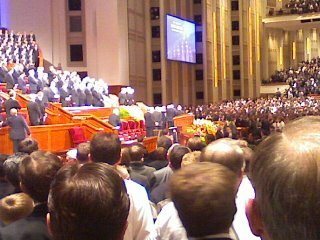 But I could see accross the aisle where the 12 and 1st presidency sat so I could see each of their profiles as they spoke. This picture is probably hard to see but if you can find the Organ, Larry was right behind it. 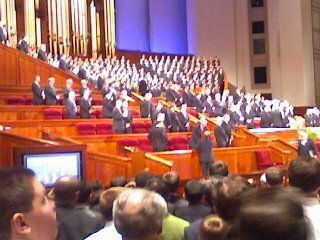 Larry's choir sounded great and the talks especially by the First Presidency were great. Thank you Larry for letting me use that ticket. I rode Trax to and from conference because Martha, Dillan, and I stayed with Martha's mom for the weekend. 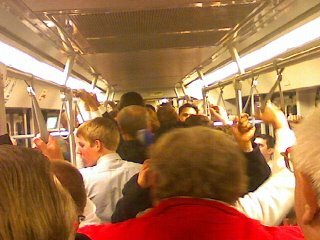 Here's a pic to illustrate how crowded the ride home was. (This was after letting a couple of trains pass to let a bunch of people get out of the way. This is Cassie posting in behalf of Mark and Laura. Mostly just so I don't have to look at my dumb indian pics anymore! The rest of you can take this as a warning that any information I find on you is free game for me to post! I love it. I had minor difficulties with the copy and paste feature so enjoy the variety of bolness, underlining and fonts. Happy Easter to all our dear friends and familly! For those of you who don't know we moved over the Christmas break and were a bit too busy to get a yearly letter sent so here it is. In December we were blessed with a family who wanted to rent our house. We began packing and had Lizzie's Birthday party and celebrated Christmas and then really began packing as we moved Dec 28th. We left after dark with Mark and the boys driving the U-haul towing his car behind. I drove the van with the girls and our cat and hamster and more stuff. It was snowing and the roads were snow covered and we saw several cars in the ditch, until we passed Mount Pleasant and then everyone was not in such a hurry and knew how to drive in the snow. We got a hotel at 1am in St Ignace, just over the Mackinaw bridge. We spent the first 6 weeks at Winter Quarters(Laura's parents) all sleeping upstairs and got along quite well. In Feb we moved into our townhouse in Daggett. We have 3 bedrooms and are settling in quite well. We have learned there is no insulation hense our heat bill is slightlty larger than our rent!!! The kids had a rough few weeks as they adjusted to a new school but are doing well now. As parents we are loving their new school as each student is individualized in their learning of math, reading and spelling. We have begun house hunting and are pondering about a large old home in Stephenson with 5 bedroom, 2 bath and a triple city lot. It needs lots of TLC and insulation and electrical wire but the price is right($40,000). Laura plays chaufer to the kids to get them home an hour befor the bus would get them there. She keeps busy helping with homework and cooking for the constantly hungry(growing) children. While living in Howell she was the secretary for the primary and Calvin's den leader for Cub Scouts. Here in Daggett she teaches the older children at church. Laura enjoys scrapbooking, gardening, painting interior walls and getting together with her sister and nephews who live 3 blocks away. Clara is 10 and in the fifth grade. She made new friends right away and went on a sleepover her first day of school. After the first few weeks of an academic rough start she is doing great in school. She even volunteers to do math problems on the board or read during class time, things she would never do in Howell. She is very creative in making stories or crafts. She is becoming a fun young lady and a joy to be around. Calvin is 8 and in the third grade. His new teacher is very strict in her policies on schoolwork and he can be very stubborn, but does great work when he wants too. (I think his teacher is wonderful) Calvin loves to be around everyone and likes to make people laugh and help in the kitchen. He loves to play outside no matter the weather and play on the computer and with his little cousins Peter and Alexander. He also loves taking care of Grandma's chickens and gathering eggs. While we lived with Grandma he would wake up at 6:30 every morning to feed the chickens. The other photo is of the kids helpng pluck and butcher the 3 roosters Grandma and Grandpa killed for eating. Josh is now 7 and enjoying 1st grade. We had a bithday party for him in our new town and had lots of his new friends come. Josh loves to play computer games, read books and play with action figures and stuffed animals. Lizzie turned 5 in December and was attending a preschool while in Howell. Since our move we have not enrolled her anywhere, but attend a weekly playgroup. Last week we signed her up for Kingergarden and she can't wait to go. She enjoys playing games and fixing puzzles and being with Mom no matter what I am doing. She is a little chatter box and lots of fun to be around. Well time to eat dinner with our family. There are 12 of us and we rotate who's house we have Sunday dinner at. Here is our address and our new email as we no longer have service with AT&T so they kicked us off. Mark and Laura Haddock, 323 W County Road 358, Daggett, MI 49821. Our cell number is still 517-672-6962 and email is michiganhaddocks@gmail.com. We hope you are all well and would love to hear from you. Let us know when you want to come visit the UP. You are always welcome.